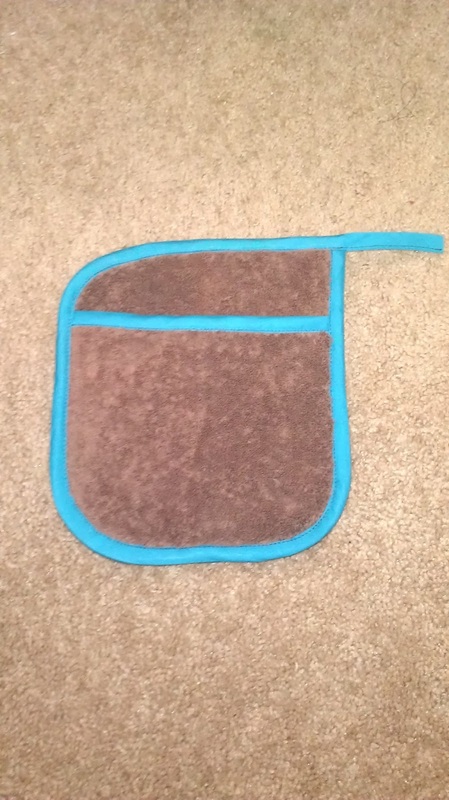 This is my favorite potholder design of all time. It has become a favorite of my family, too; they request new ones ever so often when the ones I have made before finally get worn out. 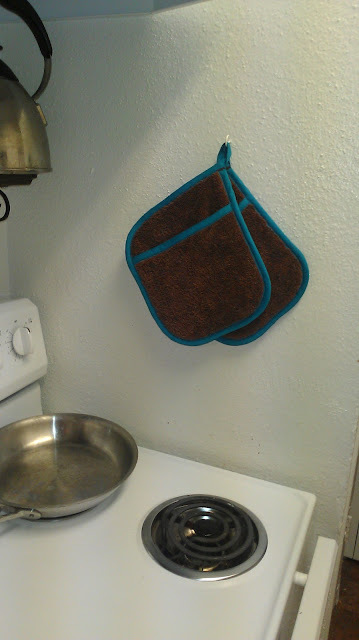 What makes this potholder so wonderful, you ask? I'll tell you. 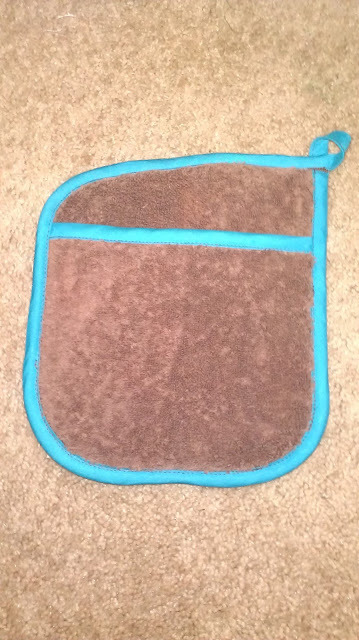 :) It's a combination potholder/oven mitt. 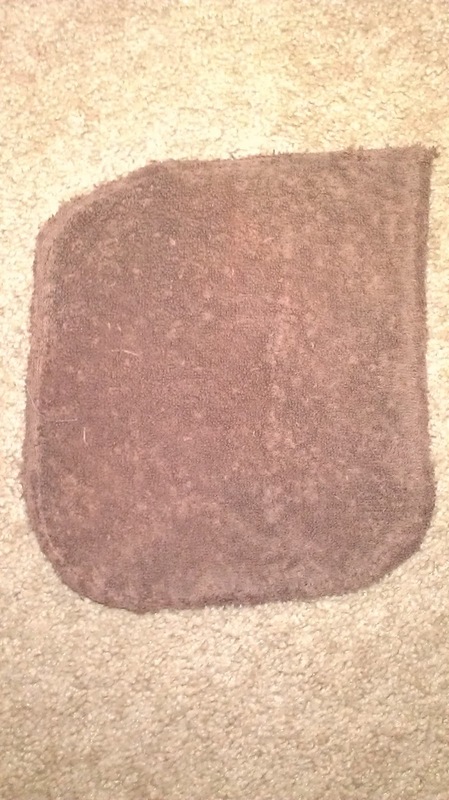 There's a pocket for your hand to slide inside, like an oven mitt, but it lays flat when you set it underneath a pot, like a potholder. It's also nice and big, so I feel like my hands are really protected. 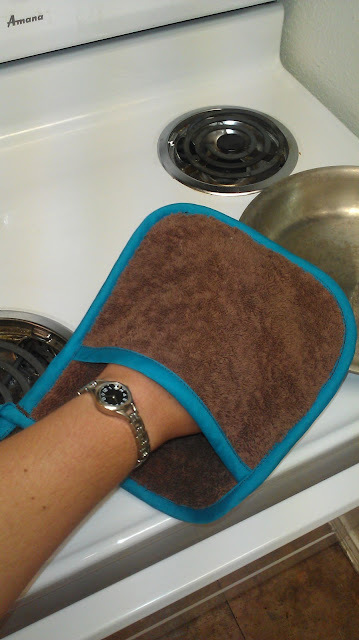 I hate trying to pull a full pan of bubbling something-or-other out of the oven with a tiny 4-inch square of fabric pinched between my fingers and the dish. 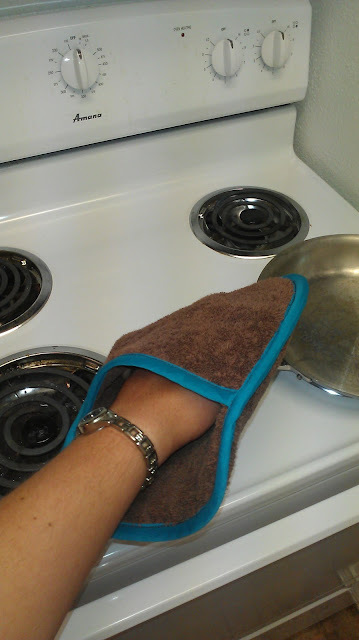 With this design, I can really get a good hold on my casserole dishes, even the ones without handles, without worrying about burning my fingers or the back of my hands if something sloshes a little. See how much room I have in there? But yet I have good control of whatever I'm carrying, unlike with a stiff oven mitt. Anyway, that's why I think they're the best. As an added bonus, they are super easy and cheap to make! All you need is a cheap towel and a package of extra-wide double-fold seam binding. I went with brown and turquoise to match my awesome dishes, which I love. The contrast also shows up well on camera, so you can easily see the process to make these. You can go with a more subtle look by matching the color of the seam binding to the towel, or you can mix it up and have some fun! 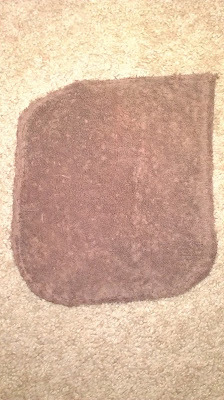 I was able to get 4 potholders out of one towel. One 3-yard package of seam binding is enough for two potholders, so you will need two packages if you want to use your whole towel. 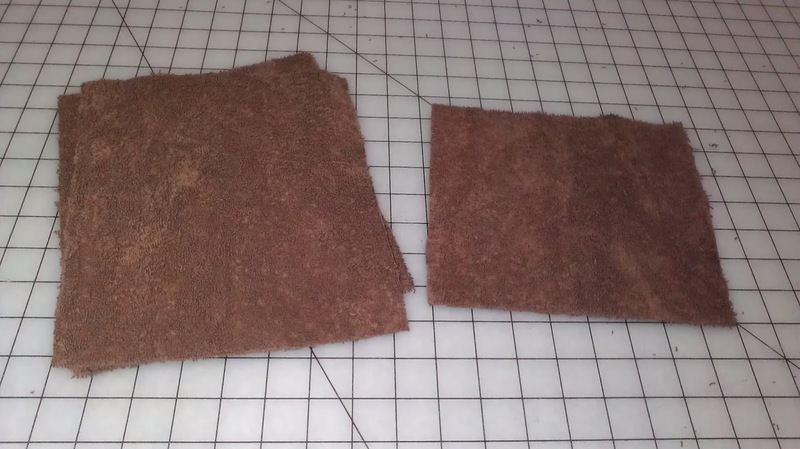 For each potholder, you will need to cut 1 7" x 8" rectangle, and 2 9" x 8" rectangles. 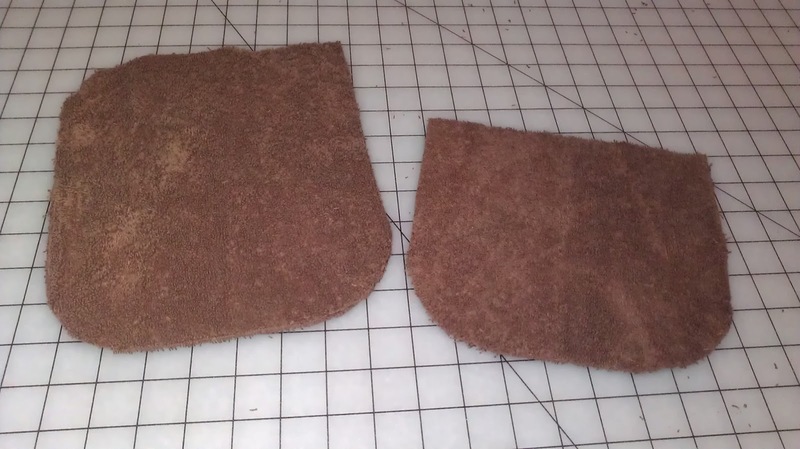 The potholder will be 8" wide by 9" long. The two 9" x 8" pieces will be stacked together to form a nice thick layer of protection for your hands. 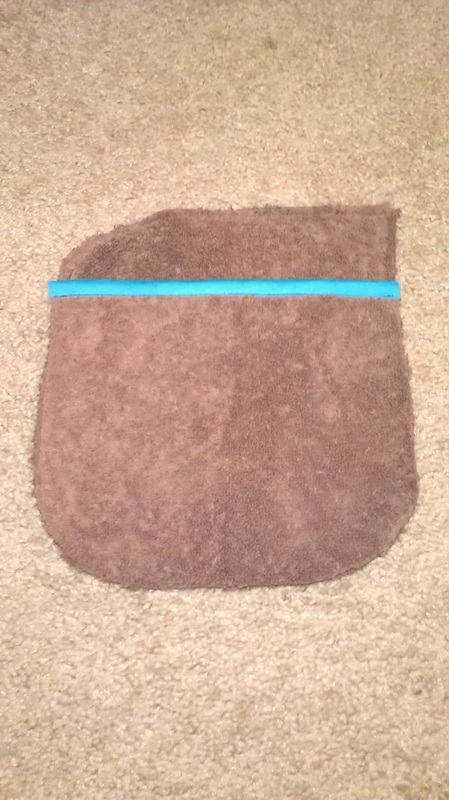 The 7" piece forms the pocket on the outside. Round 2 of the corners of the 7" piece, and 3 of the corners of the 9" x 8" piece. On the 7" x 8" piece, you are rounding what I call the two bottom corners--the ones that will line up with the bottom edge of the potholder. You want a straight edge for the part that forms the pocket opening. On the 9" x 8" pieces, leave one of the top corners unrounded. Looking at the picture may be the best way to see which corners to round. 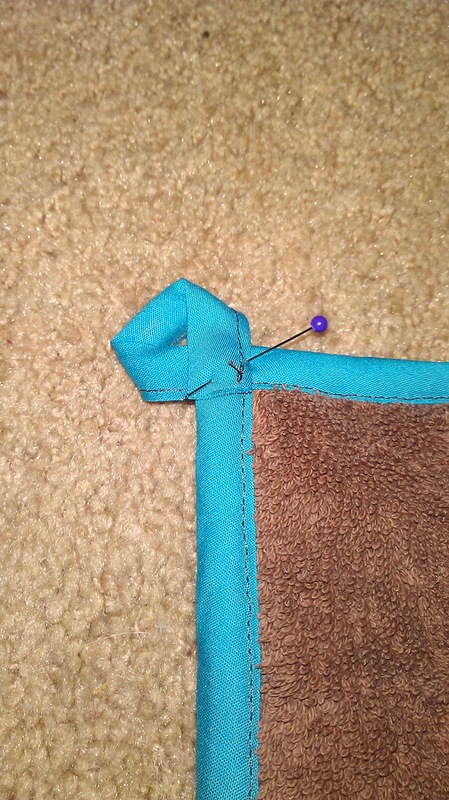 Take the pocket piece, and sew seam binding to the straight edge. 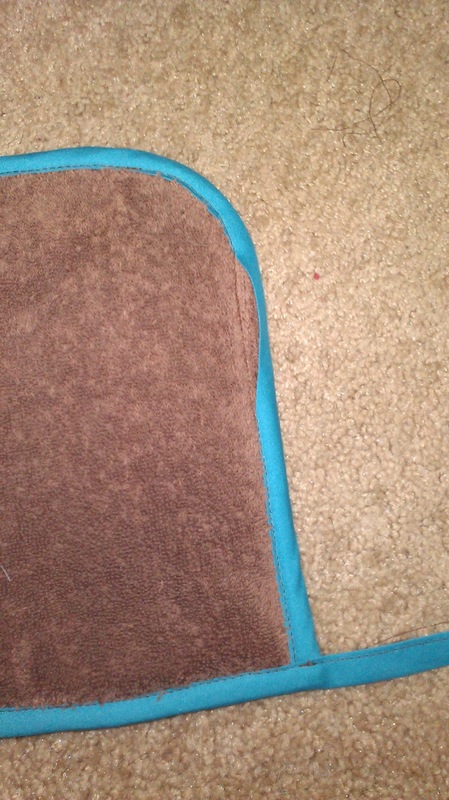 Just sandwich that edge between the two layers of seam binding and stitch it closed. 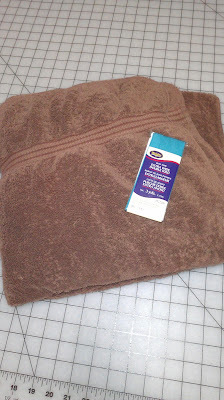 Because the towel is thick, I recommend not taking the edge of the towel quite to the fold of the binding; give it a little wiggle room. See how I have a small space between the edge of my pocket and the center fold of the binding in the picture above? Set the pocket piece aside for a moment. Taking the two 9" x 8" pieces, layer one on top of the other, and then baste them together so they essentially become one piece. Lining up the bottom rounded corners, lay the pocket piece on top of the pieces you just sewed together. I would probably pin it in a few places; there's a lot of thickness going on there! Baste around the three unfinished edges of the pocket, sewing all three layers together. If anything is a little uneven, like one piece is slightly larger than the others, don't worry about it. 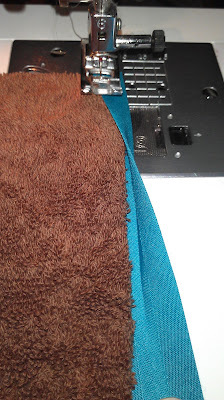 Take this time to trim it down a little before you put the seam binding around the whole thing. 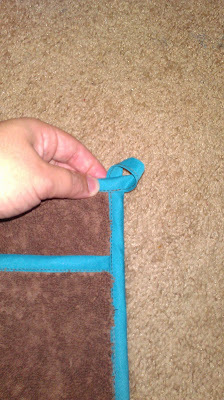 Starting at the non-rounded corner, attach seam binding around the entire perimeter of the pot holder. When you get back to your starting place, keep stitching! You want a 3" tail of seam binding hanging off the edge, so stitch past the edge of the pot holder 3", stitching the seam binding closed to form a little tail, like you see in the picture. This will make your hanging loop. 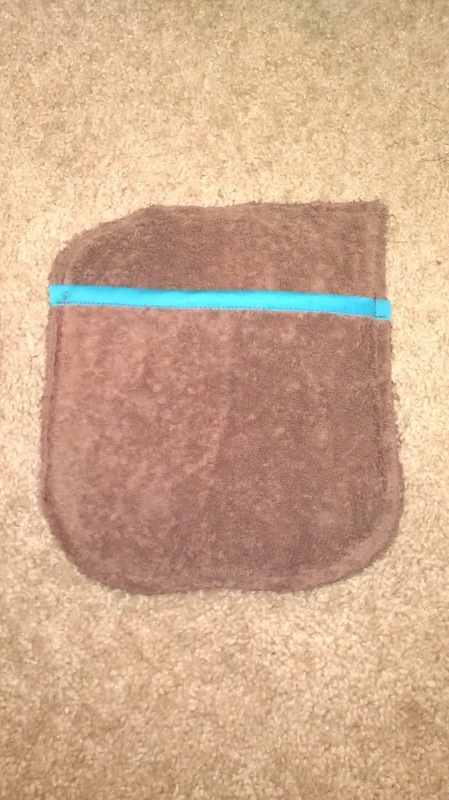 Before moving on, flip your potholder over and check the back. 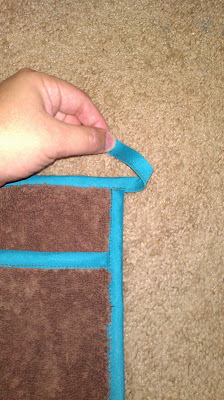 When working with this much thickness, sometimes the seam binding doesn't "catch" in the back. See the gap in the picture above where the seam binding is not stitched down? Just pull it over where it needs to be and stitch it down from this side. If you want, you can rip out the old stitches as you may have two lines of stitching now showing on the other side. I didn't bother, because I found you could barely notice them. Now, flip the potholder back over. 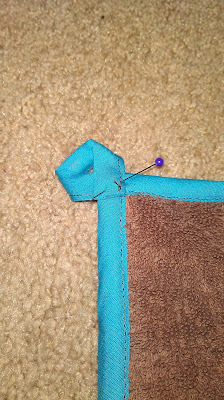 Fold the tail up and to the left at about a 45 degree angle, as shown. Tuck the end back behind the potholder, forming a loop. Pin the loop in place, lining it up straight in the back. (Notice the above picture is from the back). Stitch the loop down. 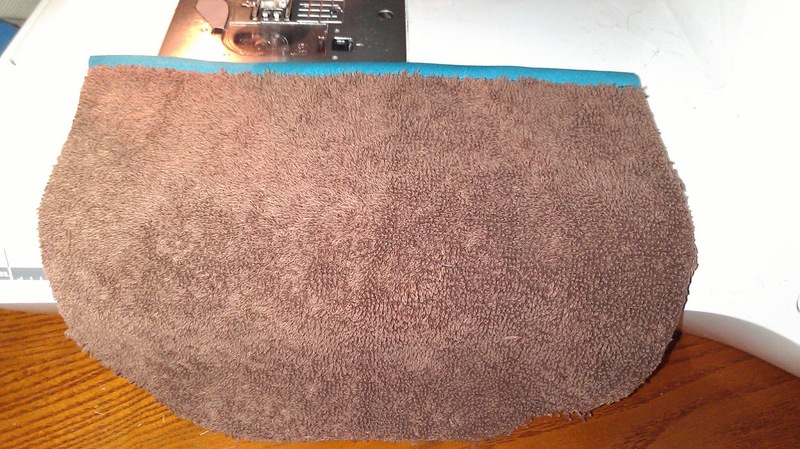 I go over it a time or two with a straight stitch to hold it in place, and then again with a tight zigzag stitch, almost like a buttonhole stitch. That sucker isn't going anywhere! With that, your potholder/oven mitt is finished! Seriously, try these out for yourself. I bet you'll love them as much as I do. They're really awesome when they're personalized with a little embroidery on the pocket piece--add a monogram or a pretty design to match someone's kitchen decor and you've got a great gift!